2071. Double-roofed plant-houses. The front and side walls of these houses are also built double, or rather hollow, as shown in fig. 599., and the space between them is filled with warm air, which is supplied by a furnace or oven, constructed behind the house for that purpose. 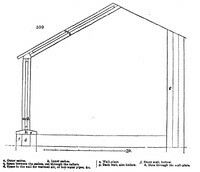 Thence the heated air is introduced between the sashes, through perforations in the wall-plate on which they stand; the rafters have, also, open spaces through their sides, to facilitate the equable diffusion of the warmth, which is thus spread as a covering over the whole house. Air is generally admitted to houses of this kind by ventilators between the sashes, so that the air becomes warmed before it is allowed to enter the house. In spring the outer sashes may be fully opened or removed. 'The expense of double glazing, and the consequent less of light, may be urged as objections to these structures; but when the immense labour of covering every evening with straw mats and shutters, the breakage of glass, and the enormous consumption of fuel, are taken into consideration, the advantage will be found on the side of the double sashes. In respect to the light, very little will be lost if the rafters are neatly made; and the deprivation, at a season when the plants are not in a growing state, is far less injurious than the scorching heat, which, when the house is formed only of single lights, is requisite to resist an intensity of cold sufficient to lower the thermometer 20ï¾¦, or even 25ï¾¦, below zero of Reaumur.' 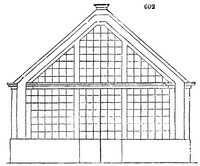 The following are the details of a double-roofed camellia house built for the Archduke John, near the Carolinen Thor, at Vienna, in 1831. Fig. 600. is the ground-plan, in which a represents the stage, and b b are the furnaces for heating the vacuity; fig. 601. is a side view; and fig. 602. a section on the line A. B. The hot-water system of heating hothouses is said to have been established at Vienna about 1820, and still earlier at Dresden.